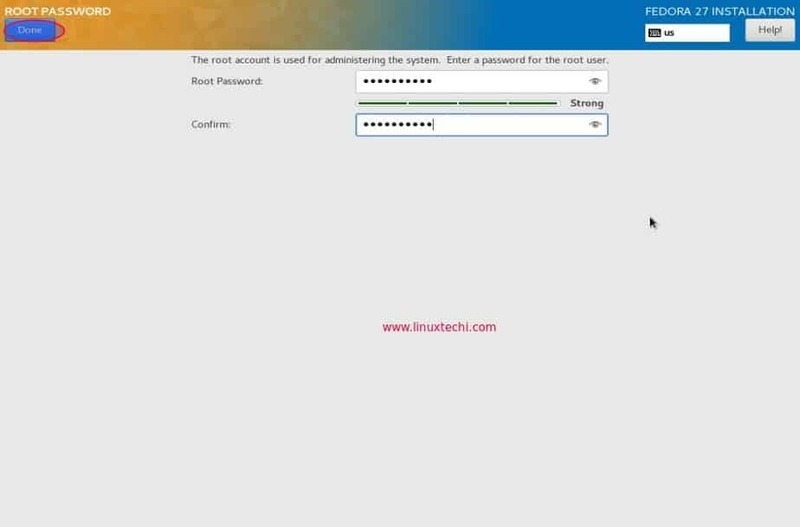 Hello and Welcome to all Linux Lovers to LinuxTechi, one of the leading Linux Tutorials and Guide website. Today we are going to see about the newly released Fedora 27 Server, its new features along with a step by step guide on how to install Fedora 27 server in your system. So let’s go directly into the article without any further wait. Fedora 27 comes packed with it a scalable database server that is highly powered by the most reliable Postgres SQL object. If you haven’t already downloaded then ensure that you download the latest version of Fedora 27 Server into your system. You can download it from here. In order to install Fedora 27 server in your system, you need a bootable disk with the downloaded live image of fedora 27 server. Boot your system with the bootable disk and ensure that the boot sequence is altered to USB Disk /DVD. 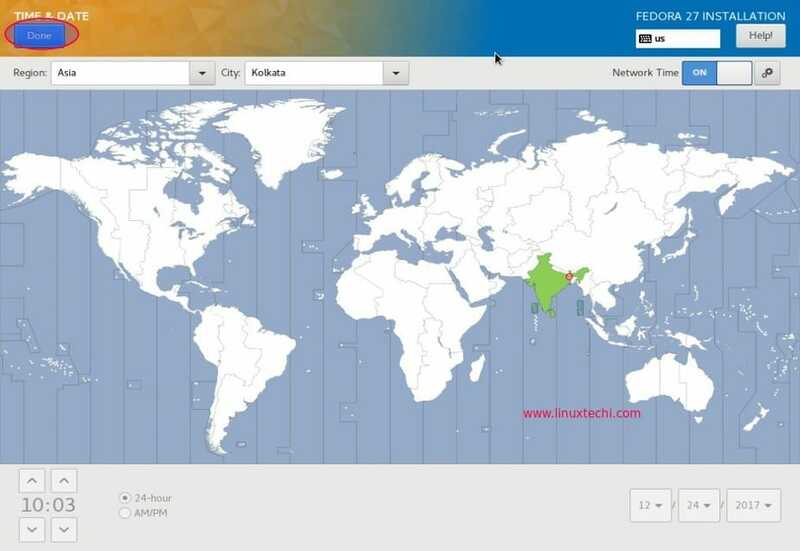 You’ll be taken back to the Installation Summary screen, click “Time and Date” to select your region, city and set your date and time accordingly. 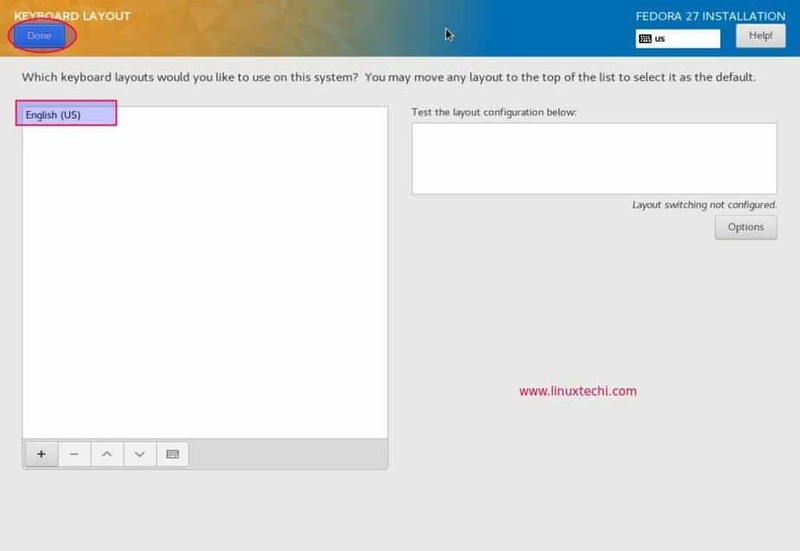 Click “Done” when select to return to the previous screen. Next step is to choose your installation destination. 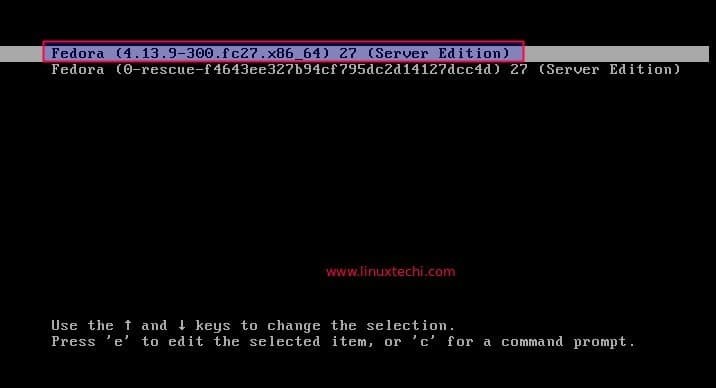 Select the device in which you need to install Fedora 27 server. 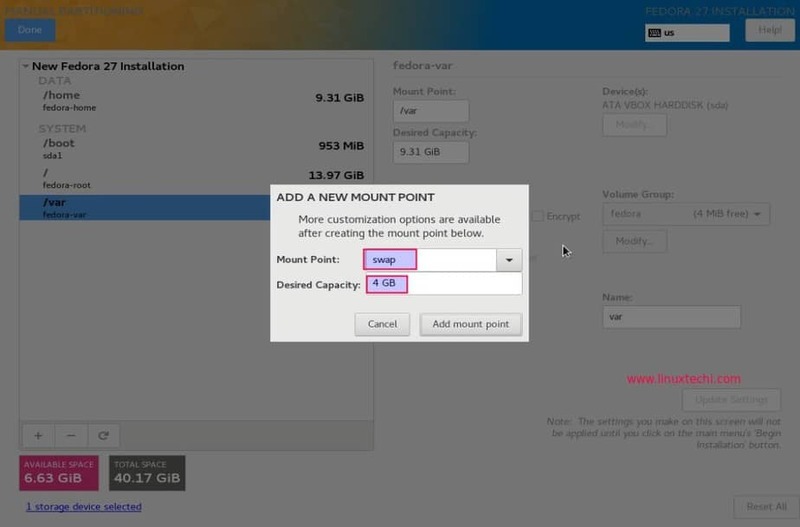 Choose “automatic” in Storage Configuration if you want make installer to create automatic partition scheme for your disk. Select “Custom” option if you are planing to have your own customize partition table, this options is only recommended to advanced Linux users. In this tutorial i will demonstrate how to create your custom partitions. So in my case i am selecting the second option. Click “Done” button on top to go to the next screen. 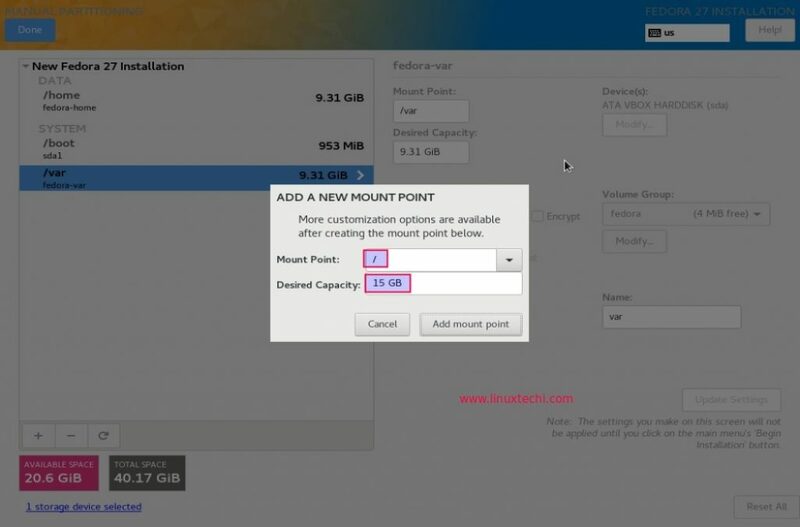 As we can see, i have 40 GB hard disk for Fedora 27 Server, i will be creating following partition on it, You can modify the partitions size depending on your disk size. Note: Whenever we create new partitions except /boot, by default all the partitions are formated as xfs during installation. Similarly create /var & / of size 10 GB and 15 GB respectively. In the last create Swap partition of size 4 GB. When we click on ‘Accept Changes’ then we will go back to the previous screen. 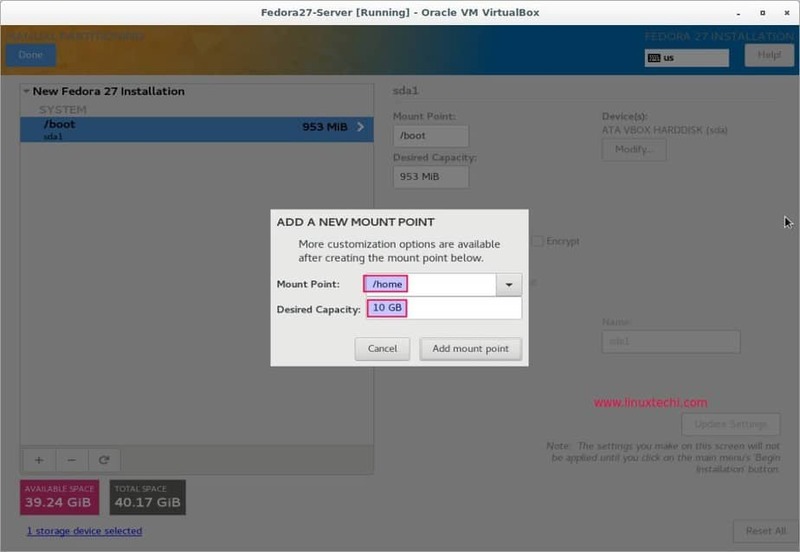 Now choose the base environment that needs to be installed. 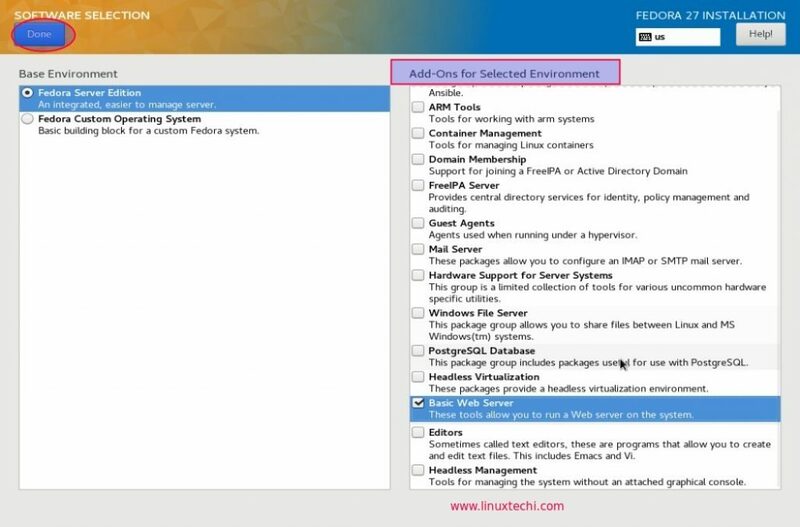 In this case choose “Fedora Server Edition” and also choose all the required add-ons for your server environment, In my Case i am selecting “Basic Web Server” as Add-ons, you can select add-ons that suits to your environment. 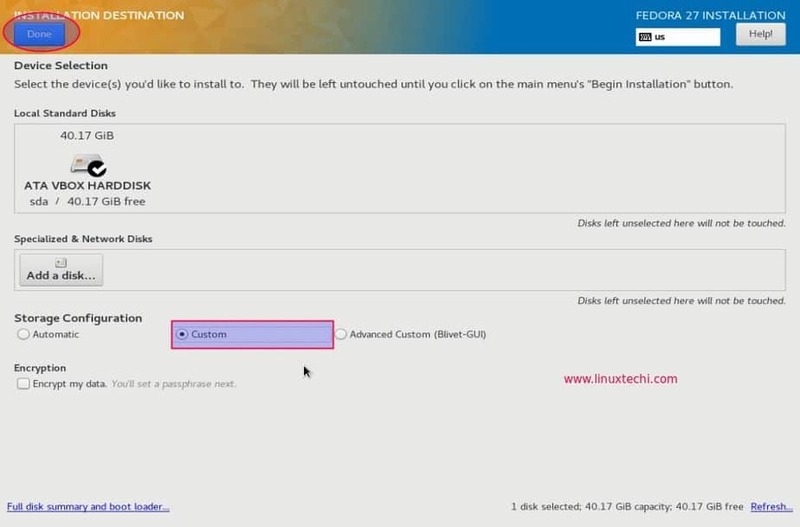 Now all settings in the installation summary screen has been made, Click “Begin Installation” to start the installation process. 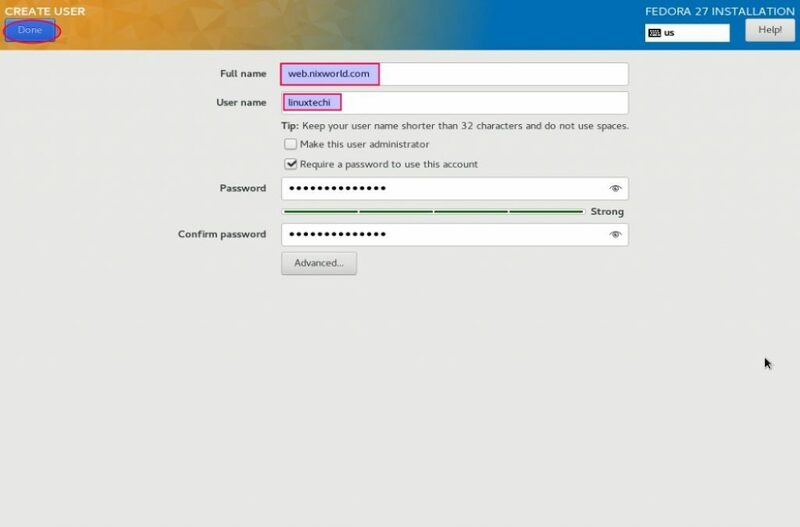 Next step is the User settings, click on Root Password to configure your root password for Fedora 27 Server. 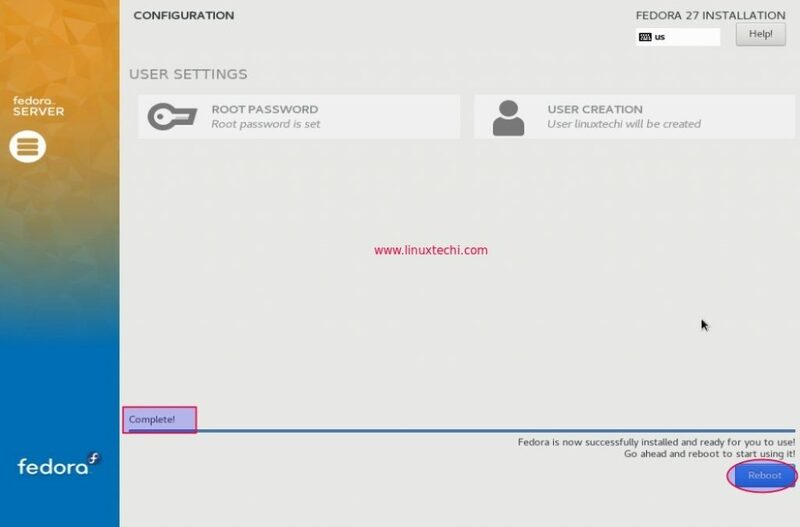 Once the installation is completed, click on Reboot button on the bottom right of your screen to start using your Fedora 27 Server. Once your system reboots, you will be prompted to login to your Fedora 27 server and once you login, you can go on with all your server tasks as usual. That’s conclude the article. 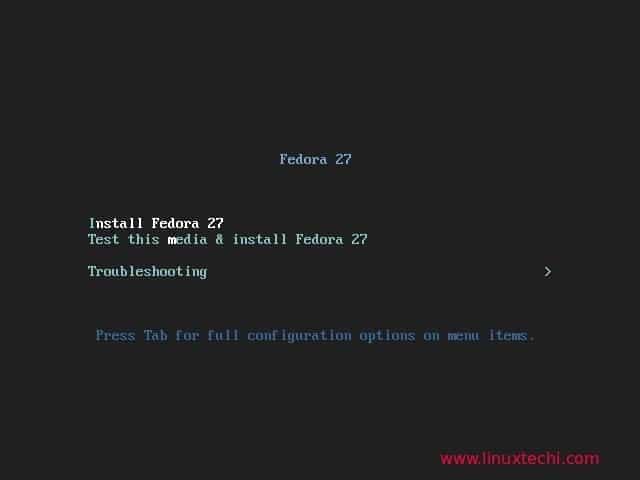 In case this article helps you to install Fedora 27 Server,. Please do share your feedback and comments. Hi. Fedora server has Desktop Envoroment? Hello, I am trying to have my installation of Fedora 27 Server initiate to the GUI and I’ve tried everything here suggested but to no avail. waiting for X Server to shut down. Server terminated Successfully (0) Closing log file.